Alton’s history includes murder, war, death and destruction, all of which figure into it’s present haunted title. Some also feel the town’s preponderance of limestone rock is a cause of the paranormal activity. Whatever the reason, this is where to find eerie activity. The most haunted place of all is the McPike Mansion. Sitting alone on a large plot of ground surrounded by trees and an iron fence, the three-story house looks straight out of a Stephen King movie. Built in1869, the house is known for its many ghost sightings, and still thought to have many of the previous occupants roaming its halls. 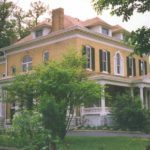 Along with this place, Alton claims a long list of sites with ghostly activity, including the city cemetery, Confederate Prison, First Unitarian Church, and Jacobs Art Center. To enjoy the full experience, sign up for a haunted tour. Alton Haunted Odyssey offers three different trolley tours that take visitors through the most haunted parts of town. The other company, Alton Hauntings, bases its tour on the book Haunted Alton by Troy Taylor, and provides a wealth of history along the way. While scary mansions are part of Alton’s past, the town’s Beall Mansion Bed and Breakfast Inn is a beacon of modern day luxury. Guest rooms feature feather beds and private baths outfitted with claw footed tubs, whirlpools for two, and showers. Guests can enjoy afternoon tea in the elegant parlor, curl up with a book by the fire, and savor a sumptuous breakfast each morning. With such pampering, the only dreams you’ll be having here will be sweet! Beall Mansion is a member of the Illinois Bed and Breakfast Association… a unique lodging experience! This entry was posted in Halloween, History, Touring Illinois and tagged Haunted towns, Illinois Bed & Breakfasts, Illinois towns by admin. Bookmark the permalink.